The action plan for China's "One Belt and One Road" initiative highlighted Northwest China's Xinjiang Uyghur Autonomous Region as the core area on the Silk Road Economic Belt, and East China's Fujian Province as the core area on the 21st Century Maritime Silk Road. Northeastern China is considered the gateway to China's northward opening. The Global Times interviewed three experts on these regions to find out the opportunities that the action plan will bring to regional development. The "One Belt and One Road" initiative will make Xinjiang serve as a "bridgehead" in China's westward opening. Xinjiang is a typical inland region, and its economic development has lagged behind China's coastal provinces and regions. The initiative will boost bilateral trade and investment between Xinjiang and the countries in Central Asia. To become the core area of the Silk Road Economic Belt, Xinjiang strives to transform itself into a transport hub, a center of trade and logistics, culture and technology, as well as financial and healthcare services. Infrastructure construction will be carried out to achieve the goal. Xinjiang's advantage lies in its abundant natural resources, its location next to Central Asia's oil and gas resources, and a batch of policy support following the second central work conference on Xinjiang in May 2014. Strengthening energy cooperation with Central Asian countries will not only boost Xinjiang's economic development, but also ensure China's energy security. However, Xinjiang's social stability and economic development have been threatened by the "three evil forces" of separatism, extremism and terrorism. Strengthening anti-terrorism cooperation is also a major task for Xinjiang and the Central Asian countries along the Silk Road Economic Belt. Fujian Province's core position on the Maritime Silk Road can be traced back to the Song Dynasty (960-1279). Quanzhou, a city in Fujian, was known as the largest port in Asia during the Song Dynasty and the Yuan Dynasty (1279-1368). Situated across the Taiwan Straits, the province also has a geographical advantage that can help strengthen ties with Taiwan, Hong Kong, Macao and Southeast Asia. Last but not the least, the Mazu culture that originated in Fujian still has a long-term influence on overseas Chinese in Southeast Asian countries. The provincial government is drafting a plan to implement the "One Belt and One Road" initiative. In my view, four cities in the province - Quanzhou, Fuzhou, Xiamen and Pingtan - should play a leading role in promoting trade, investment and cultural communications with countries and regions along the 21st Century Maritime Silk Road. Fujian can trial some special policies to boost cooperation with Southeast Asian countries, and the province's newly approved free trade zone (FTZ) can serve as a testing ground. The Belt and Road initiative and the FTZ can both boost the province's development. They will not only help the province open up, but also stimulate reform. The action plan will bring development opportunities to northeastern China, which is dealing with a downturn in its economy and struggling with an unreasonable economic structure that relies too much on resources and heavy industry. The northeastern provinces - Heilongjiang, Jilin, and Liaoning - should seize the opportunity to strengthen ties with Russia, South Korea and Japan. Although trade volume between China and Russia plummeted 30.7 percent year-on-year in the first two months of this year, the decline is temporary due to the depreciation of the ruble, Western sanctions on Russia and low commodity prices. 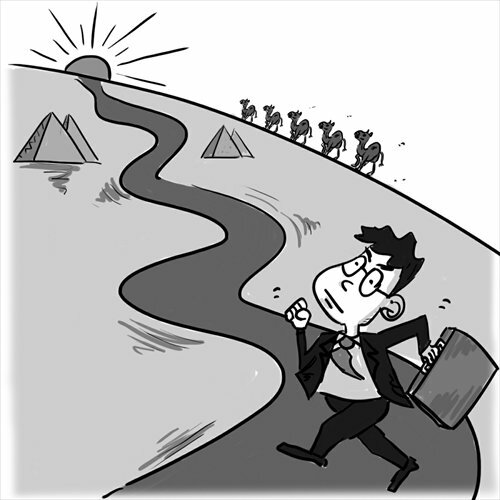 The two countries should seek long-term development by strengthening connectivity. Infrastructure construction is a major focus. The action plan called for the creation of a Eurasian high-speed transport corridor that links Beijing and Moscow. Heilongjiang Province has already rolled out a plan to build a cross-border railway network linking its capital city Harbin to Manzhouli in the Inner Mongolia Autonomous Region and then Russia and Europe. A railway container center is under construction in Harbin. Chinese companies have also participated in the construction of the Zarubino port in Russia's Far East region, which will facilitate sea-land multi-modal transport. China and Russia could also strengthen cross-border industrial cooperation in sectors including aviation, auto manufacturing, high-end equipment manufacturing and agriculture, which will help revitalize Northeast China's old industrial bases.